After a big post earnings drop, this stock is in rebound mode. 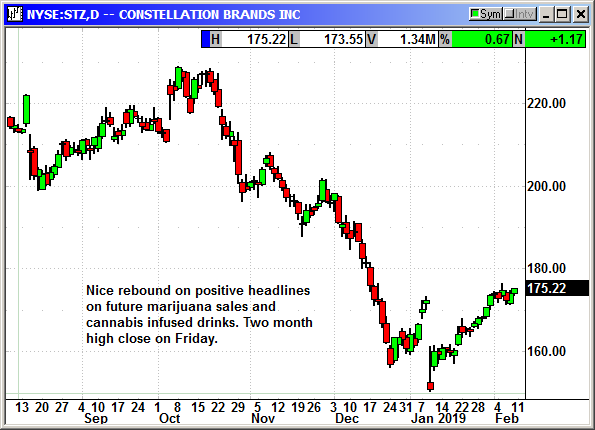 Constellation Brands is a great company with the worst behind them. I considered reloading the Stanley Black & Decker position but decided to wait until later this week to see if a rebound appears. The company reported earnings of $2.37 that beat estimates for $2.06. Sales rose 9% to $1.97 billion and beat estimates for $1.91 billion. Beer sales rose 16% to $1.21 billion to beat estimates for $1.16 billion. Wine and spirit sales rose 0.4% to $762.8 million and beat estimates for $747.8 million. For 2019 the company cut guidance from $9.60-$9.75 to $9.20-$9.30. Analysts were expecting $9.43. They said beer sales would still rise 9% to 11% but wine and spirit sales were expected to decline in the low single digit range compared to prior guidance for 2% to 4% growth. Sales of wine were down but the company said they were going to reduce their low margin products and products under $11 and concentrate on higher dollar wines with higher margins. Once they begin marketing cannabis infused products, the sales are going to explode. Getting those products through research and development is going to take months but investors should be able to anticipate the profits. The CEO said Canopy was expected to produce $1 billion in revenue over the next 18 months and that was 56% more than analysts expected. As Canopy begins to report these numbers, Constellation will benefit. Options are somewhat expensive, and I am recommending April so the earnings expectations will keep the premiums inflated. If you want to offset some of the premium you can sell a corresponding put. I am recommending a 180/160 combination. If you do not want to sell the put then use the $185 call option. Buy long Apr $180 call, currently $6.10, stop loss $169.75 . Sell short Apr $160 put, currently $2.75, stop loss $169.75.